Step 1 : Twist strands of your hair (the thicker the strand, the looser the curl) until you can even see the twisting at the roots. Wrap the strand around (on your scalp) into a little circle, then pin it down with 2 bobby pins, criss-crossing each other. and Repeat for all your hair. Step 2 : after sleeping on the little spiral buns. 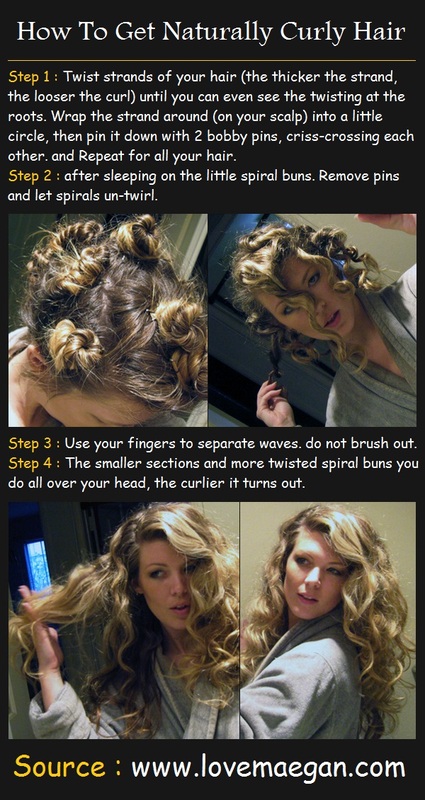 Remove pins and let spirals un-twirl. Step 3 : Use your fingers to separate waves …do not brush out. Step 4 : The smaller sections and more twisted spiral buns you do all over your head, the curlier it turns out.